« July 2014 Photo Challenge #eatfoodphotos: The Food Photo-A-Day! Some posts here are planned. 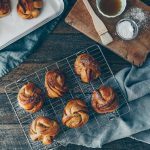 Recipes dreamt up, sometimes over days or weeks, inspired by a weekend brunch outing or an overseas trip or a rainbow memory. Primped and polished and put on show as if there were a method to the madness. 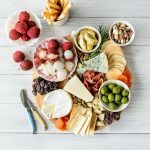 Others however are a result of a hazy vision — a quick fix driven by a craving and combined with whatever happens to be languishing the fridge at the very moment I want lunch. You see, at some point back in March I had a papaya craving. 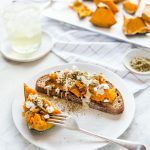 Not just any craving mind you but one for sweet ripe wedges sprinkled with a bit of chilli and doused with lime juice — because the weather was still warm enough to pretend a tropical holiday was knocking on the door and it seemed right to celebrate. The local grocery store however was not so accommodating, and instead had on display a lovely selection of not-quite-ripe-enough-to-be-sold-as-ripe fruit. 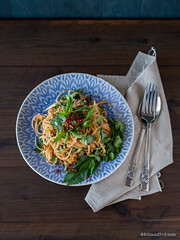 Enter a pointy tropical holiday memory of green papaya salad on a beach in Thailand a few years ago, a fridge of fresh herbs leftover from some recipe testing, a bit of quinoa from dinner the night before, a jar of dried chillies that seems to reproduce on its own. In no time at all the spice and tang I was craving were sorted but in the process so was the need for a proper lunch rather than a perpetual afternoon grazing session, how terribly convenient. As an added benefit it ended up so pretty I simply had to take a few photos before devouring the entire plate. 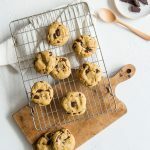 The unplanned recipes are almost always edible, but sometimes they win hands down. 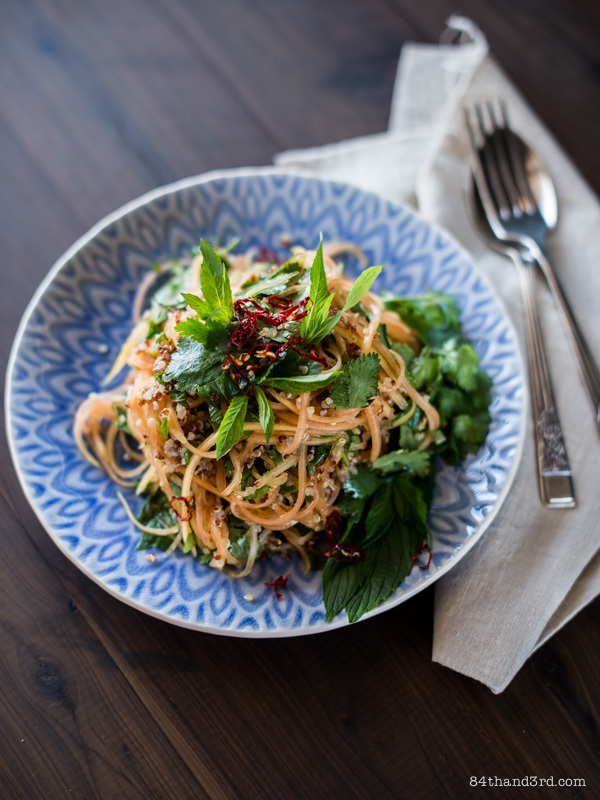 This is not a traditional Thai Green Papaya Salad, it is however the perfect quick-tangy-spicy fix, and a great way to tart up leftover quinoa. Feel free to add shredded carrots, cucumber, snake beans or green beans and roasted peanuts if you wish. Peel papaya and scoop out seeds. Shred or thinly slice into a large bowl. Warm cooked quinoa in a hot pan with a touch of oil and a splash of water, stirring until heated through. 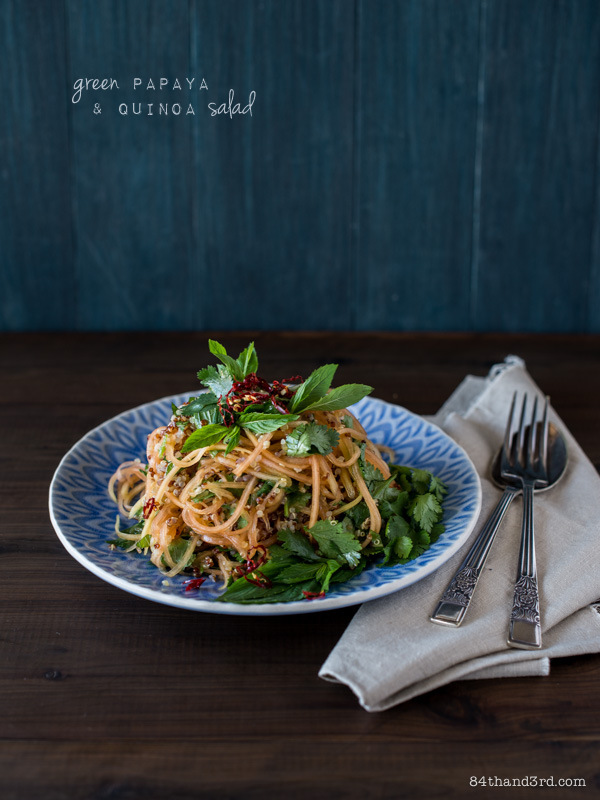 Toss quinoa, torn herbs and sliced chilli through the shredded papaya. 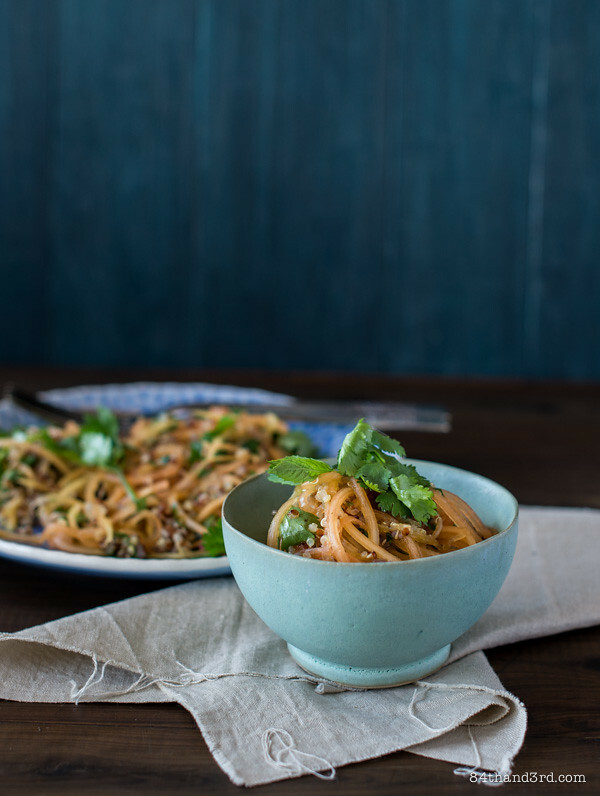 Whisk together lime juice through fish sauce, drizzle over salad and serve immediately. Fish sauce is optional but encouraged if you have it on hand. Leave it out for a vegetarian or vegan version, adding a pinch of sea salt to taste. I swear by my julienne peeler for shredding pretty much any fruit or vegetable, if you don’t have one get one asap! I agree JJ! Although usually I make them at night and only make enough for dinner so end up with shocking photos. Now speaking of shocking photos/improving them…. when are you going to let me in on your backdrop creating secrets? I am getting desperate! Looks delicious…wish I could do what you do with food. 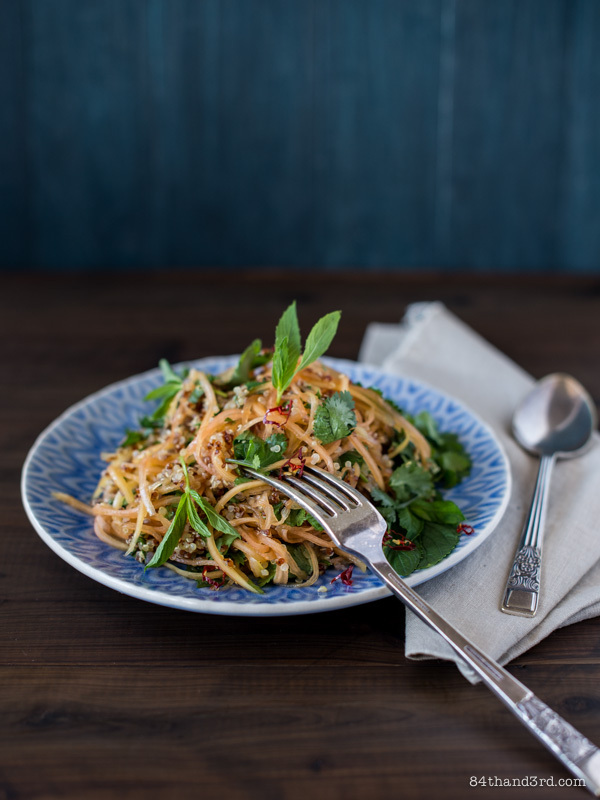 Green papaya salad is a firm favourite! Loving the light in your top photo too! what a pretty looking salad! i love how green papaya brings a salad to a whole new level! 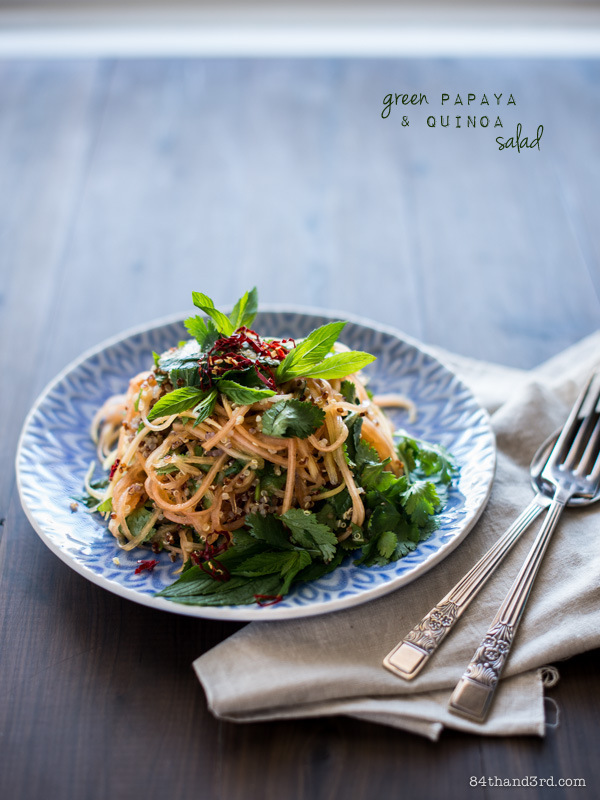 I am very much a green papaya fan girl, such a great addition to a salad. It might not be entirely traditional but it sure looks pretty good to me. Thanks for the tip!